Shraddha is a ceremony for offering food and water to the deceased persons, primarily the parents and/or forefathers. In this seva, the presence of sevakarta is mandatory. 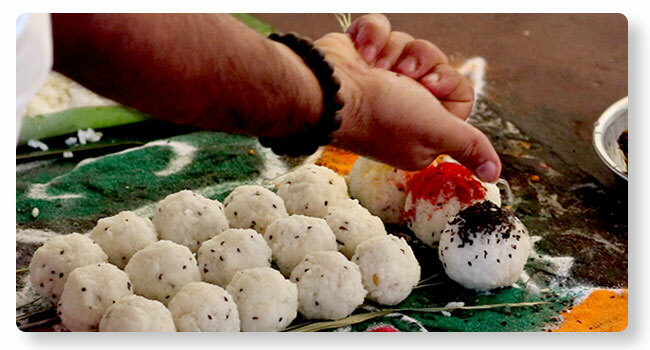 Three Pindas or rice balls are offered to the departed forefathers on the Vishnu Pada. It brings peace and good result, as it has been said in the Shastras that Shraddha should be performed in ‘Teertha Kshetras’ (holy places). Tripindi Shraddha is an offering in the memory of the departed, in which offerings are made in the memory of the ancestors, when for various reasons the Shraddha has not been performed continuously for three years. To satisfy souls of ancestors, a vidhi is performed that is known as Tripindi Shradha.